My family and I love Zehnder’s. We live close to Frankenmuth, and Zehnder’s has always been the stop for us. We get so busy living our lives and doing life. Our stay at Splash Village always gives me, my husband, and two kids that family time that we need. As our kids have gotten older, Zehnder’s continues to entertain them. Fun for all ages! Great memories are created every time. The staff is great. The food is great. Thanks Zehnder’s! ~ Tara F.
Zehnder’s of Frankenmuth is our go-to for our lady’s getaway every year. We love the beautiful and comfortable accommodations, and the friendliness of the hotel staff. The food, whether it be at the main restaurant, or the Elf Hollow Cafe, is delicious! We love the splash park, especially the family raft ride! Everyone likes the lazy river and the hot tub after a busy day of shopping. You can’t beat the design of the hotel and restaurants as well as the cleanliness of the rooms and pool areas. It’s a family tradition! ~ Donna S.
Unprecedented customer service, whimsical atmosphere, dedication to family fun (for all ages), and the most amazing food! These are the reasons why our family LOVES Zehnder’s. We are newer residences to Michigan, however Zehnder’s has stolen our hearts and our loyalty. Approximately 3 months ago, we booked a stay at Kalahari Resorts in Ohio, drove 3 hours to get there and were overwhelmed and disappointed. That same night we packed up our car, drove another 3 hours so that we could stay at Zehnder’s. We always feel at home, welcomed, and loved. Thank you! ~ Korah H.
When I was a little girl, our entire extended family would visit Zehnder’s every December just before Christmas to celebrate together! I have wonderful memories of the good food, fun with aunts, uncles and cousins and of course – the ride along the freeway when we knew we were getting close seeing the giant Santa Claus! After our dinner – the kids were always allowed to get ice cream with the cute little figurines! We’d trade them! Then we’d shop in the “basement” getting all the wonderful treats and treasures! ~ Penny H.
Zehnder’s symbolizes tradition for my family. A meal at Zehnder’s is a significant component of every Frankenmuth trip. Menus are unnecessary—all family style! It’s the only place where I actually eat fried chicken. Where we ask for another bowl of chicken noodle soup before the server finishes distributing the first round. It’s where overeating is inevitable. There’s always room for more buttered noodles. Where we get excited for the monkeys in our ice-cream. Where bakery favorites are chicken seasoning, brownies, and raisin bread. Zehnder’s was a part of my childhood and will remain a special place throughout my life. ~ Lydia G.
Zehnder’s absolutely embodies the spirit of what coming together as a family means. Our stays have been filled with laughter, love and making memories in beautiful and fun filled venues that Zehnder’s has made. The Zehnder’s tradition that myself and my wife grew up with have now been shared and passed along to our children, who consistently ask when we are going back. Thank you Zehnder’s for allowing us to make memories. ~ Jason O. The first time I visited Frankenmuth, in the 80’s was such an amazing time I swore I would continue to return when I had a family. I have 3 daughters, and we have returned a few times. This year was my daughter’s 12th birthday. We never told the girls where we were going until we were almost there, and the surprise and joy on their face was priceless! Zehnder’s has outstanding service, amazing food, and the best people. It honestly felt like we spending her birthday with family, and we do consider Zehnder’s to be a part of our family. 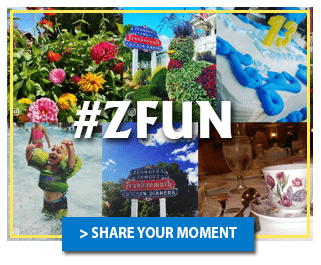 ~ Dan S.
I like Zehnder’s for the FANTASTIC chicken dinners, fun shopping at the Marketplace, and their long tradition of hospitality….truly a landmark, and “must-visit” in Frankenmuth! ~ Kathleen C.
Zehnder’s has been a part of my family’s visits to Frankenmuth for as long as I can remember. The chicken dinners, bakery, and Snowfest. More recently, my husband and I chose to have our wedding reception there! The service was amazing! I would love to stay at Splash Village and give my boys memories like what I had growing up. ~ Sara K.
We love Zehnder’s because the whole family finds something they love. It is a great success when you vacation with family and everyone looks forward to their favorite activities. A beautiful destination in a gorgeous town! ~ Tina G.
My family and I have been coming to Zehnder’s for the past thirty years for birthdays, holidays and other special days or just a fun weekend. There is always something of interest to do, if it’s just a stroll through town after a delicious dinner and especially taking in all the decorations around holiday time; one can’t help but get in the spirit of the time. A wonderful place to go for a clean, family outing or weekend. ~ Goebel B. When my Dad was young, he used to have great memories of Zehnder’s. Naturally he took his family to Zehnder’s to make more memories. We’ve celebrated birthdays, Mother’s Day and even Easter at Zehnder’s. Now, I bring my children. They say you have the best buttered noodles on the planet. No others compare! I have failed at many attempts to even come close. Thank you Zehnder’s for making your family, part of our family! ~ Lisa A.
Zehnder’s allows us to be a family! We put down our phones, shut off the TV and enjoy our time together. We laugh, make new memories and cherish the small things. We remember what life is all about; love and family! ~ Lisa S.
Zehnder’s feels like home. You can expect the same great service and meal you remember as a kid, and cherish with your own family. You know what to expect and look forward to and it keeps us coming back for a great meal and memories. ~ Emily M.
My family & I have been going to Zehnder’s for as long as I remember, sharing many memories there. The food has always been delicious and the experience wonderful. It always felt warm and inviting. The noodles are my favorite, as well as the strawberry rhubarb jam! From my family to yours, thank you for the memories! I look forward to many more dinners and shopping in the market below with Zehnder’s! ~ Kelly G.
Ever since I was a child, my family has made it a ritual to visit the little German town of Frankenmuth around Christmas, summer, and the fall. Now my siblings and I are grown, we have continued the tradition by taking my nieces and nephews. Nothing warms my heart more than hearing them ask 50 times if we are there yet and to see their faces light up with joy once we arrive at the “water park”. Frankenmuth is more than little Bavaria to us, it’s a place where memories are made and traditions are continued. ~ Emily B. We like Zehnder’s because of the memories! Memories visiting as a child and memories for my children! Great food, great fun, great family time! ~ David T.
We Love Zehnder’s for the excellent food, atmosphere, super friendly staff, the beautiful building and grounds, the entire town, the state of Michigan and the GREAT feeling knowing we are on our way to our favorite place to eat! (And we drive there from New Jersey!) ~ Mark D.
Visting and working at Zehnder’s has been a lifetime experience. It started 27 years ago when I was first employed at the restaurant. I have many fun memories from that time. I scored my first par at The Fortress. My daughter learned to swim at Splash Village swimming classes and she is the biggest fan of buttered noodles which I can recreate at home thanks to my insider knowledge. Some of our other favorites are giant donuts, Cowpath Pilsner, chocolate covered cherry mice, BUTTERHORNS, and Hubbard squash. ~ Kimberly R.
The food goes without saying! Growing up in Brown City in a lower middle class family, Zehnder’s was a privilege; an event special for the entire family. My sister and I had a “plastic menagerie”of all the little animals that stood proudly atop our orange/vanilla ice cream. My first taste of Shirley Temple came in Frankenmuth. As did my first taste of family values and the value of family. Though I now raise my own family in Oklahoma, Zehnder’s is always on our bucket list when we visit family in Pure Michigan. ~ Kim B.
I like Zehnder’s because it’s not just a place, it’s an experience. From the moment we step into the restaurant or Splash Village, we feel like we are on a little vacation. The atmosphere and staff make each visit warm and welcoming and we appreciate the little details that make these businesses different. Even though we are relatively close, we can’t visit frequently, but when we do, we are never disappointed. Thank you for making Frankenmuth a tradition and a destination place in our area. ~ Amy E.
We love Zehnder’s because it’s not too far but far enough for a quick getaway. The kids love the water park, the grown-ups love the bakery and everyone loves the food. ~ Mindy C.
Four generations of our family has gone to Zehnder’s for quality and delicious family meals. Zehnder’s is a place that we’ve made countless memories. From milestones to victories, we’ve celebrated them at Zehnder’s. It’s a place we associate with love, family, laughter, quality, and tradition. ~ Katharine W.
Zehnder’s has been a constant tradition for our family. Every birthday, anniversary, return from military deployments, and other special occasion we celebrate with a family meal at Zehnder’s. Zehnder’s brings our family together, and we have many memories sharing our celebrations with the Zehnder’s staff, who feel like family with their own excitement at each celebratory event. ~ Randi B. Our family loves Zehnder’s because Zehnder’s is all about family! From the home-style meals, to the oceans of family fun in the water park, we make awesome memories on every trip there. In a busy world with busy schedules, Zehnder’s is the perfect way to slow down, unplug and reconnect! ~ Sherri A.
Zehnder’s means so many things. It is fond memories of Sunday drives to Frankenmuth with my family as a little girl. We would enjoy dinner at Zehnder’s. Now as a parent I get to share some of my childhood traditions with my children, but now these drives include an overnight stay at Splash Village. My sons enjoy all that Splash Village has to offer and I get to share a piece of my childhood with them! ~ Laura S.
We love Zehnder’s because it’s a safe, clean, fun way to spend quality time with family. It holds a lot of memories for us as my husband and I spent our first Christmas with his side of the family there. There is so much to do in the area and the atmosphere is so cool. It is one of the few times our kids will actually play together like kids are supposed to. And, as parents we love the lazy river. 🙂 ~ Andrea W.